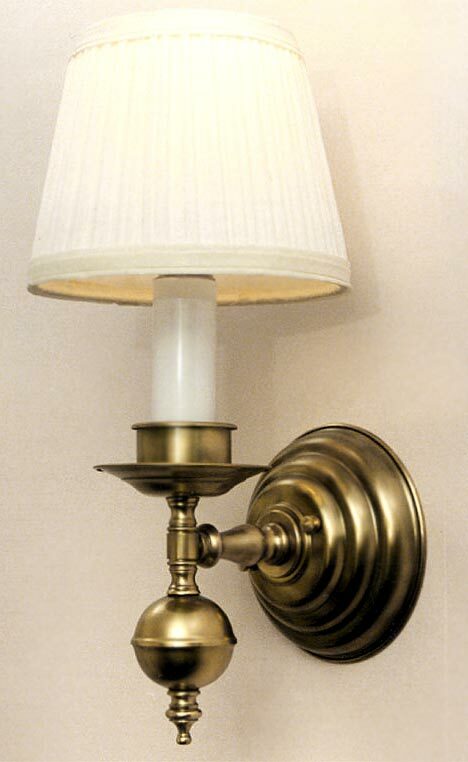 Antique brass Colonial single arm wall sconce. Great in pairs beside a master bed or bathroom vanity mirror, beside decorative picture frames, powder room or wherever that 'tailored' look is required. Choose your metal, back plate, lower finial and white, egg shell or black shade. It's your design... it's YOUR home! Compare to MODEL 105 for a different look. Width 6 In. / Projection 8 In. / Depth 13 In.